Well documented already this month were the U.S. sales results from the Honda HR-V’s first (abbreviated) month on the market. 6381 HR-Vs were sold in America in May, 674 more than the Chevrolet Trax managed in its best month yet, nearly 2000 sales more than the Jeep Renegade achieved in its second full month in America, and nearly 3000 sales more than the total reported in the Mitsubishi Outlander Sport’s record month. But that’s just it. May wasn’t just a month of great success for the HR-V, a sign of what’s to come from Honda, the maker of America’s best-selling SUV/crossover, the CR-V. May was a great month for many of the HR-V’s rivals. Subaru USA sold 7876 XV Crosstreks in May, a 36% year-over-year improvement to the highest level ever for the XV. It was just the second month in the XV’s 33-month history that sales topped the 7K mark. The XV outsold non-WRX/STi Imprezas by more than 2200 units. Renegade sales are steadily increasing, rising 5% between April and May after more than tripling between March and April, the Renegade’s first full month. The Chevrolet Trax has been available in the United States since December. With 5705 sales, the Trax’s May performance was up 42% compared with its previous best performance from March. 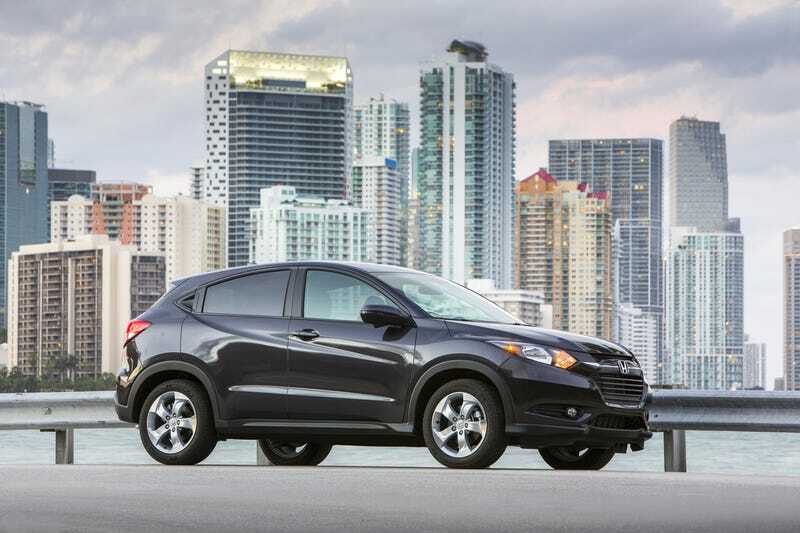 May also marked the first month in which the Trax outsold its Buick Encore twin. The Encore topped 5000 sales for the third consecutive month in May. On sale since January 2013, 105,871 Encores have been sold so far. Oft-ignored Mitsubishi reported the best month of Outlander Sport sales in the nameplate’s 56-month history. With 3384 units sold, May was just the third month ever that Outlander Sport volume topped 3000 sales. Despite declines from the Nissan Juke and Mini Countryman and only a handful of sales from the discontinued Mini Paceman and just-arrived Fiat 500X, the category as a whole jumped 95% to nearly 38,000 sales in May. (We didn’t include the Kia Soul, for example, because it’s not available with all-wheel-drive, although the Soul routinely outsells all these “urban crossovers.”) A big number? Sort of. Given the freshness of the category and the fact that Mazda is just now joining the ranks with the far more enthusiast-pleasing CX-3, yeah, it’s a big number. Don’t forget about the aforementioned CR-V, however. Or its cohorts. These ten vehicles have generated fewer than 128,000 sales so far this year. Honda has already sold 135,000 CR-Vs, not even taking into account the fact that Chevrolet, Ford, Toyota, and Nissan have all topped the 100K barrier already this year with the Equinox, Escape, RAV4, and Rogue, respectively. Compact crossovers are a hot topic in the automotive industry, and they’re bound to be progressively more popular. But by the standards of their big brothers, they’re most definitely still too small to ride on the big kids’ rollercoaster.